WINNING MARE IN FOAL TO HOT YOUNG STALLION "EUROZONE"
SHE IS A FULL SISTER TO THREE WINNERS INCLUDING THE STAKES PLACED "GOOD PRINCE"
DIAMOND PLAYER COMES IN FOAL TO THE EXCITING YOUNG STALLION "EUROZONE"
EUROZONE IS ON FIRE HAVING HAD TWO STAKES WINNERS IN TWO WEEKS "KRONE" AND THE UNBEATEN "MYSTERY LOVE"
DIAMOND PLAYER IS DUE TO FOAL IN THE FIRST WEEK OF AUGUST. CASINO PRINCE (AUS) (2003). 5 wins-3 at 2, AJC Chipping Norton S., Gr.1. Sire of 488 rnrs, 329 wnrs, 15 SW, inc. All Too Hard (MRC Caulfield Guineas, Gr.1), Escado, Hooked, Star Rolling, Longport, Mighty Lucky, Casino Dancer, Fine Bubbles, Sookie, Cool Gambler - Lim's Cruiser (Sing. ), etc. Sire of the dams of SW Formidable, SP Covert Ops and of Beyond Dispute, Tysonic, Isn't She Elegant, Fast Stepping, Heavenly Bridges, Picaro, Boyslightup, etc. Good Prince (g by Casino Prince). Winner at 1000m, 2d MRC Debutant S., L.
Boyslightup. Winner at 1200m in 2018-19 in NZ. Love Las Vegas (f by Casino Prince). 2 wins at 1200m, 3d ATC Tab.com.au P.
Diamond Player (f by Casino Prince). Winner. See below. It's Thirsty Work (g by Sequalo). Placed at 2 in Aust. AMOVATIO (g Al Maher) 9 wins-1 at 2-from 1200m to 1600m, A$1,003,910, Hawkesbury Gold Cup, Gr.3, VRC Winter Championship Final H., L, MRC Weekend Hussler S., L, ATC December H., Time to Shop at TAB H., McGrath Estate Agents H., Eric Kime H., TAB Iphone App 2YO P., VRC VRV-CRC Winter Championship Heat H., 2d VRC Winter Championship Final H., L, Qld Tatt's RC Spear Chief H., L, Scone Cup, L, 3d ATC Newcastle Newmarket H., Gr.3, BRC Wayne Wilson S., L, 4th VRC L'Oreal Paris S., Gr.3. Grand Rhumba. 13 wins-2 at 2-to 1100m, A$211,100, AJC Intergaze H., 3d AJC Lonhro Welter H., STC Rosehill Gardens Event Centre H.
Lionel Left Me (f Casino Prince) Winner at 1200m, SAJC Melbourne Parkview Hotel P.
Navigation. 6 wins-1 at 2-to 1400m, A$100,650 in Aust. Megafactory. 5 wins at 1200m, A$147,110, to 2017-18, 2d WATC Year of the Dog H., Westspeed H., Caitlin Forrest Tribute H., WATC Derby Day 16/4 H., Belmont Bonanza H., 3d WATC Budget Rent a Car 2YO P., Westspeed 2YO P.-twice, Vale Phyllis Morris H., Westspeed H., Del Basso Smallgoods H., Weddings at Ascot H.
Heads of State (g Casino Prince) 2 wins at 1000m in Aust. Hearts of Gold. Winner. See above. Hurricane Harbour. 4 wins from 1300m to 1600m, A$116,250, to 2017-18, 3d ATC Membership H.
MAGNETO (c Scenic (Ire)) 11 wins from 1400m to 2450m, A$348,720, VATC Herbert Power S., Gr.2, NSW Tatt's RC Tattersall's P., L, VATC Monash International H., Silver Agripower H., Harry's Liquor H., Lincoln H., Kingston Town H., Phuoc Tuy H., Sweet Nell H., 2d Moe Cup, 3d VATC Trenton H.-twice, 4th VATC Sandown Cup, Gr.2. 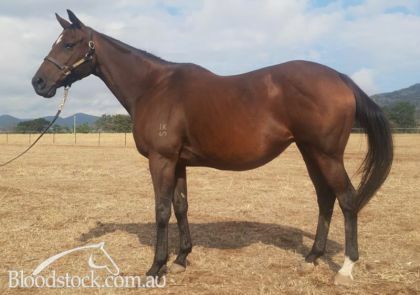 Benfica Princess (f Benfica) 7 wins from 1200m to 1650m, A$180,550, to 2018-19, Qld Tatt's RC Functions at Tattersall's P., BRC Brc.com.au H., Prostate Cancer Australia H., Relaxed Racing H., SCTC Access Insulation H., 2d BRC Brc.com.au H., Ipswich TC K&R Plumbing Supplies 2YO P., 3d BRC Princess S., L, SCTC Property Today Real Estate, North Shore Realty P.
ROYAL PARDON (c Vice Regal) 4 wins-1 at 2-from 1200m to 2000m, A$429,160, AJC Frank Packer P., Gr.2, 2d AJC Derby, Gr.1. Sire. RAID (f Pins) 5 wins-1 at 2-at 1150m, 1200m, NZ$263,560, Rotorua RC Lion Red P., L, 2d ARC Diamond S., Gr.1. Producer. STRATUM STAR (c Stratum) 8 wins from 1300m to 2200m, A$2,450,460, MRC Sir Rupert Clarke S., Gr.1. VIRAGE DE FORTUNE (f Anabaa (USA)) Joint top filly on The 2005-06 Australasian 3YO Classification. 8 wins-5 at 2-to 1400m, A$954,100, QTC Sires' Produce S., Gr.1, MVRC Australia S., Gr.1. Producer. AVENUE (f Anabaa (USA)) 8 wins-1 at 2-to 1300m, A$730,413, MVRC Champagne S., Gr.3, 2d MRC Oakleigh P., Gr.1. Producer. SLAPSTICK (f Anabaa (USA)) 2 wins at 1200m, 1600m, A$248,470, Illawarra TC Keith F Nolan Classic, Gr.3, 2d Scone RC Inglis Guineas. Producer. RAILINGS (g Zabeel) 7 wins from 1800m to 2400m, A$3,172,110, MRC Caulfield Cup, Gr.1, AJC Metropolitan H., Gr.1, 2d STC BMW S., Gr.1-twice, 3d Australian Derby, Gr.1, STC Ranvet S., Gr.1. PIMMS TIME (f Pins) 5 wins from 1200m to 2000m, NZ$100,475, Cambridge JC Travis S., Gr.2, Hawkes Bay Hastings RSA Lest We Forget H. Producer. RUMYA (f Red Ransom (USA)) 4 wins-2 at 2-from 1200m to 1600m, R870,000, Greyville Golden Slipper, Gr.1. BADAWIYA (f Al Maher) 4 wins from 1200m to 1600m, A$362,425, VRC Edward Manifold S., Gr.2, 3d MRC Thousand Guineas, Gr.1. RUN NAAN - SHINING GEM (H.K.) (g Makfi (GB)) 2 wins at 2, A$122,100, HK$241,500, in 2017-18, VRC Maribyrnong P., Gr.3, 3d MRC Blue Diamond Preview (c&g), L.
RAIHANA (f Elusive Quality (USA)) 4 wins-1 at 2-from 1400m to 1900m in South Africa and U.A.E, UAE Oaks, L, 2d Meydan Al Fahidi Fort S., Gr.2. Producer. RAGEESE (c Street Cry (Ire)) 4 wins to 1400m, A$563,760, VRC L'Oreal Paris S., Gr.3, 2d ATC Sires' Produce S., Gr.1. Race Record: Winner at 1250m in Aust. 2017 (f by Eurozone). Destroyed. 2018 (f by Stratum Star). Served by Eurozone. Date of last service, 09.09.2018.